Eosinophils are bone marrow-derived cells released into the circulation during hypersensitivity reactions and parasitic infections. Under normal conditions most eosinophils are tissue bound, where their physiologic role is unclear. During in situ analysis of the thymic microenvironment for CD11c+ dendritic cell subpopulations (APC critical in the process of thymic negative selection) a discrete population of CD11b/CD11c double-positive cells concentrated in the cortico-medullary region of young mice was detected. Thymic CD11c+ cells were isolated, and the CD11b+ subpopulation (CD44high, class IIlow, CD11cint) was identified as mature eosinophils based on: scatter characteristics, major basic protein mRNA expression, and eosinophilic granules. They are hypodense, release high levels of superoxide anion, and express CD25, CD69, and mRNA for IL-4 and IL-13, but not GM-CSF or IL-5, suggesting a distinct state of activation. Thymic eosinophils are preferentially recruited during the neonatal period; absolute numbers increased 10-fold between 7–14 days to reach parity with dendritic cells before diminishing. In a model of acute negative selection, eosinophil numbers were increased 2-fold 6 h after cognate peptide injection into MHC class I-restricted female H-Y TCR transgenic mice. In both peptide-treated female and negatively selecting male H-Y TCR mice, clusters of apoptotic bodies were associated with eosinophils throughout the thymus. Our data demonstrate a temporal and spatial association between eosinophil recruitment and class I-restricted selection in the thymus, suggesting an immunomodulatory role for eosinophils under nonpathological conditions. The maturation and differentiation of T lymphocytes occur primarily within the thymic microenvironment. After maturation, migrating cells are self-restricted and purged of high affinity reactivity with common self-Ags (1, 2). The selection of the final circulating repertoire occurs through direct interaction with epithelial and hemopoietic elements of the thymic microenvironment (3, 4). Positive or negative selection is proposed to occur upon TCR engagement of the epithelial or hemopoietic compartments, respectively, based on three variables: state of thymocyte maturation, avidity of ligation, and presence of poorly defined secondary signals. Thymic dendritic cells (DC)2 (2) express high levels of CD11c and MHC class II molecules and are restricted primarily to the medulla (4, 5). Their role in negative selection has been established by following the fate of superantigen-reactive T cells in bone marrow chimeric animals, in vitro by reaggregate organ cultures (6), and through manipulations of MHC class I or II expression in mutant mouse models (7, 8, 9). The eosinophil is a terminally differentiated, end-stage granulocyte that comprises <1% of circulating leukocytes (10). Conventionally associated with host defense against parasitic infection, through degranulation and release of toxic proteins, eosinophils also produce a variety of pro- and anti-inflammatory cytokines, growth factors, and chemokines (10, 11, 12, 13). Eosinophils can act as APC (14, 15) and express several important costimulatory molecules (11, 16), indicating that they could modulate adaptive immune responses. Eosinophils marginated in respiratory, gut, and urogenital subepithelium represent 95% of the total population, yet their physiological role is unclear. In a study of thymic DC populations, identified by coexpression of CD11c with a panel of myeloid markers, we observed a discrete population of CD11b/CD11c double-positive cells localized around the cortico-medullary region (CMR) in young mice. Isolation and further characterization identified these cells as eosinophils. They have an activated phenotype, and their number and distribution vary during thymic ontogeny in a variety of mouse strains. We demonstrate that eosinophils are preferentially recruited during class I-restricted T cell selection and that they express presentation and costimulatory molecules. Our data indicate that the eosinophil is a numerically important member of the thymic microenvironment and imply an immunomodulatory role for eosinophils. Male and female C57BL/6 (B6), BALB/c, DBA/2, and CBA mice were bred under specific pathogen-free conditions, which included surveillance for five ectoparasites and 10 endoparasites, in our own facility and used between 14–21 days unless stated otherwise. Female I-Aβ−/− and β2-microglobulin (β2m)−/− mice on a B6 background were also maintained in our facility and used at 2–4 wk of age. Hemagglutinin-specific (HA) TCR transgenic mice (ABII) on a BALB/c background were class II restricted and provided by A. Sarukhan (Institut National de la Santé et de la Recherche Médicale (INSERM), Unité 373, Institute Necker, Paris, France; Ref. 17). TCR H-Y mice on a Rag-1−/−, Thy 1.1, B6 background were class I restricted and provided by B. Rocha (INSERM 345, Institute Necker) (18). B. Lucas (INSERM, Unité 345, Institute Necker) provided RelB−/− mice on a B6 background (19). Both TCR transgenic and RelB−/− mice were kept under specific pathogen-free conditions at the Faculty of Medicine, Hôpital Necker (Paris, France). Mice were injected i.p., as described previously (20), with 50 nmol of peptide diluted in PBS. Peptide sequences were SFERFEIFPK representing aa 110–119 of HA, and KCSRNRQYL, representing acids 738–746 of the Y-linked protein Smcy (21) The animal facilities and care followed the norms stipulated by the European Community for the care and use of laboratory animals. The following affinity-purified mAbs were prepared in the laboratory unless otherwise stated and titrated by FACS. For depletion, RA3-6B2 (anti-CD45R; B220) and KT3 (anti-CD3), gifts from P. Leenen (Erasmus University, Rotterdam, The Netherlands), and Mel 14 (anti-CD62L) and YTS 169.4 (anti- CD8α), gifts from F. Lepault (Centre National de la Recherche Scientifique, Unité Mixte de Recherche 8603, Hopital Necker, Paris, France) were used; for positive selection, biotinylated N418 (anti-CD11c) or M1/70 (anti-CD11b; Mac-1) was used. For cell sorting, PE-conjugated HL3 (anti-CD11c), biotin-conjugated anti-CD44 (PharMingen, San Diego, CA), and FITC-conjugated 25-7-9 (anti-I-Ab) or 14-4-4S (anti-I-E), gifts from C. Boitard (INSERM, Unité 342, Hopital Saint Vincent De Paul, Paris, France), were used. For phenotyping, anti-CD4-PerCP, CD8α-allo-PE, CD8α-FITC, CD19-PE, CD11b-PE, CD25-biotin, CD49d, and CD69-biotin CD161-PE were all purchased from PharMingen. Anti-CD80-PE and CD86-PE (Serotec, Oxford, U.K.), BM8 (Bachem, Voisins-le Bretonneux, France), FITC-conjugated RB6-8C5 (anti-Ly-6G, Gr-1), FITC-conjugated F4/80, and 2.4G2 (anti-FcγRII and III; gift from F. Lepault), and RM153 (anti-CD153/CD30L; gift from K. Okumura) were also used. Biotin-conjugated 28-8-6 (anti-H-2Kb/H-2Db) was a gift from B. Rocha. ER-BMDM1 (anti-CD13), NLDC-145 (anti-DEC-205), ER-HR3, MOMA2, and CDR1, gifts P. Leenen, were used as supernatant unless specified otherwise. For immunohistochemistry, rabbit anti-fibronectin and rabbit anti-laminin were obtained from Novotec (Lyon, France) and rabbit anti-von Willebrand factor was purchased from Dako (Trappes, France). M1/70 (anti-CD11b/Mac-1) and FITC-conjugated N418 (anti-CD11c) were prepared in the laboratory. Thymuses were frozen in dry ice-cooled isopentane. Sections were cut at 3 μm and air-dried. Tissues were fixed in acetone kept to −20 C for 10 min, immediately washed in two changes of PBS, then incubated with 1% H2O2 for 15 min. Sections were rinsed in PBS and passed into 100 mM Tris-HCl (pH 7.6), 150 mM NaCl, and 0.05% Tween 20 (TNT) and preincubated for 30 min with blocking buffer (NEN, Paris, France). Primary Abs were optimally diluted in blocking buffer (N418-FITC was diluted 100-fold greater than optimal) and incubated with sections for 30 min at room temperature. In some staining, supernatants were applied undiluted after sections had been briefly rinsed, for a further 30 min. Slides were washed in TNT, incubated with peroxidase-conjugated anti-FITC (F(ab′)2; Roche, Meylan, France) for 30 min, and then washed. Sections were then incubated for 5 min with tyramide-FITC (NEN) diluted 1/75 in amplification buffer. After washing with agitation, sections were incubated with swine anti-rabbit conjugated with 7-amino-4-methylcoumarin-3-acetic acid (AMCA; Vector, Burlingame, CA) and donkey anti-rat (The Jackson Laboratory, Bar Harbor, ME) conjugated with Alexas-546 (Molecular Probes, Leiden, The Netherlands) according to the manufacturer’s instructions. Sections were washed, mounted in PBS, and viewed and photographed on a Leica DM epifluorescent microscope (Deerfield, IL) equipped with narrow band filter sets optimized for Coumarin (AMCA), FITC, and Cy3 (Alexas-546 equivalent). To enrich the stromal elements of the thymus, a previously described density cut separation procedure was used with several modifications (5). Media were adjusted to be iso-osmotic with mouse serum. Nycodenz (Life Technologies, Cergy-Pontoise, France) was prepared at a density of 1.069 g/cm3 with monovalent salt solution (MSS)-EDTA (168 mM NaCl, 42 mM KCl, 5 mM HEPES, and 5 mM EDTA) as previously described (5). Thymuses from 10–20 young mice were washed and placed in RPMI 1640 supplemented with 5 mM HEPES, 2% FCS, 1 mg/ml collagenase (type III; Life Technologies), and 20 ng/ml DNase (Sigma, St. Quentin Fallavier, France). Tissues were first chopped with fine scissors and continuously agitated with pipetting for 20 min at room temperature. Undigested fragments were removed by unit gravity sedimentation, mechanically dispersed, and recombined before addition of 0.1 M EDTA to break up rosetting. Cells were washed through FCS-EDTA, resuspended in Nycodenz, and centrifuged at 1700 × g. Fifty to 70% of the top layer was taken, diluted 5-fold with MSS supplemented with 5% FCS-EDTA (MSS-FCS-EDTA), and centrifuged. Cells were resuspended in MSS-FCS-EDTA on ice and incubated with the mAbs Mel 14, RA3-6B2, and KT3 for 30 min. After washing, cells were incubated with anti-rat magnetic beads (Dynal, Oslo, Norway) at a cell to bead ratio of 1:6 for 20 min at 4 C with gentle agitation. Bound cells were removed under a magnetic field from the cell suspension, washed, and resuspended in MSS-FCS-EDTA for further selection. Positive selection of cell populations based on one phenotypic marker was conducted using streptavidin (SA)-conjugated MACS beads (Miltenyi Biotec, Bergisch Gladbach, Germany). Cells resuspended in MSS-FCS-EDTA were incubated with a biotinylated mAb on ice for 30 min. The cells were washed, incubated with SA-magnetic beads for 30 min, washed again, and passed through a MACS Vario column according to the manufacturer’s instructions. Before placing cells in culture, they were washed extensively in large volumes of EDTA-free full balanced saline solution containing 5% FCS. Electronic sorting of cells was conducted after negative selection. Cells resuspended in MSS-FCS-EDTA were stained in three colors: anti-I-Ab or I-E-FITC, anti-CD11c-PE, and anti-CD44-b followed by SA-conjugated allo-PE (PharMingen). Cells were first gated based on forward (FSC) and side (SSC) scatter, then on high expression of CD44. Populations were sorted based on their expression of MHC class II and CD11c. RT-PCR was conducted using conventional methodology. Briefly, cells (1 × 106) in suspension were spun down and resuspended in 200 μl of RNABle (EuroBio, Les Ulis, France). After separation in the presence of chloroform, the aqueous phase was precipitated in 2 vol of ethanol and 2 μl of pellet paint (Novagen, Madison, WI). Samples were resuspended in 20 μl of sterile RNase-free water. Reverse transcription (avian myeloblastosis virus, Promega, Charbonnieres, France) was performed on 5 μl of extract using random hexamer and oligo(dT) primers (Promega). Each reaction was diluted 10-fold and stored at −20 C before PCR amplification. For PCR, 5 μl of diluted cDNA was used as a template in 50-μl reactions under standard thermal cycling conditions. Reaction products were separated on 1.8% agarose gels containing 100 ng/ml ethidium bromide. Primers (5′ to 3′) were: CD11b: forward, TTACTTGCGACCAGGACAGG; reverse, CGTTTTCACCATCTTCTTTG (673 bp); DEC-205: forward, AGCACCGCCTCTTTCACCTG; reverse, TGTCCTCTTTTCCCGTAATG (600 bp); RelB: forward, CTGCGGGAGGTGGAGGTGAC; reverse, TCGTAGGGTGGCGTTTTGAA (578 bp); IL-1α: forward, CAGTTCTGCCATTGACCATC; reverse, TCTCACTGAAACTCAGCCGT (218 bp); IL-2: forward, GACACTTGTGCTCCTTGTCA; reverse, TCAATTCTGTGGCCTGCTTG (227 bp); IL-3: forward, GACCCTC TCTGAGGAATAAG; reverse, CTCCAGATCGTTAAGGTGGA (232 bp); IL-4: forward, TCGGCATTTTGAA CGAGGTC; reverse, GAAAAGCCCGAAAGAGTCTC (216 bp); IL-5: forward, TCACCGAGCTCTGTTGACAA; reverse, CCACACTTCTCTTTTTGGCG (201 bp); IL-6: forward, GTTCTCTGGGAAATCGTGGA; reverse, TG TACTCCAGGTAGCTATGG (208 bp); IL-10: forward, AGAGCAAGGCAGTGGAGCAG; reverse, GGGATGACAGTAGGGGAACC (254 bp); IL-12 p40: forward, AAGCACGGCAGCAGAAGAATAAA; reverse, CCAACC AAGCAGAAGACAGC (478 bp); IL-13: forward, GACCCAGAGGATATTGCATG; reverse, CCAGCAAAGTCTGATGTGAG (214 bp); IL-16: forward, AGGGACAGAACAGGGTGAGA; reverse, GTGAGGTGGGCAGCAGAGAC (272 bp); GM-CSF: forward, TGAACCTCCTGGATGACATG; reverse, GTGTTTCACAGTCCGTTTCC (218 bp); TNF-α: forward, TCTCATCAGTTCTATGGCCC; reverse, GGGAGTAGACAAGGTACAAC (212 bp); TGF-β: forward, ACCGCAACAACGCCATCTAT; reverse, GTAACGCCAGGAATTGTTGC (200 bp); IFN-γ: forward, GCTCTGAGACAATGAACGCT; reverse, AAAGAGATAATCTGGCTCTGC (227 bp); eotaxin: forward, TTCTATTCCTGCTGCTCACG; reverse, CTGGACCCACTTCTTCTTCTTGG (227 bp); β2m: forward, TGACCGGCTTGTATGCTATC; reverse, CAGTGTGAGCCAGGATATAG (222 bp); and major basic protein (MBP; 387 bp) (22). Cells were cultured in modified RPMI 1640 iso-osmotic with mouse serum and supplemented with 5 mM HEPES, 10−5 M 2-ME, 1 mM sodium pyruvate, 2 mM glutamine, and 100 U of streptomycin and penicillin. After extensive washing to remove EDTA, cells were dispersed in culture medium containing GM-CSF (20 ng/ml; R&D Systems, Abingdon, U.K.) and cultured at 106 cells/ml in 24- or 96-well plates. For three-color analysis, 106–105 cells were stained with FITC-, PE-, and biotin-conjugated mAb in MSS-FCS-EDTA, washed, and incubated with SA-allophycocyanin. Samples were washed in MSS-EDTA and 2% FCS and were analyzed immediately without fixation on a FACScalibur (Becton Dickinson, Mountain View, CA). Data were analyzed with WinMDI software (http://facs.scripps.edu/). 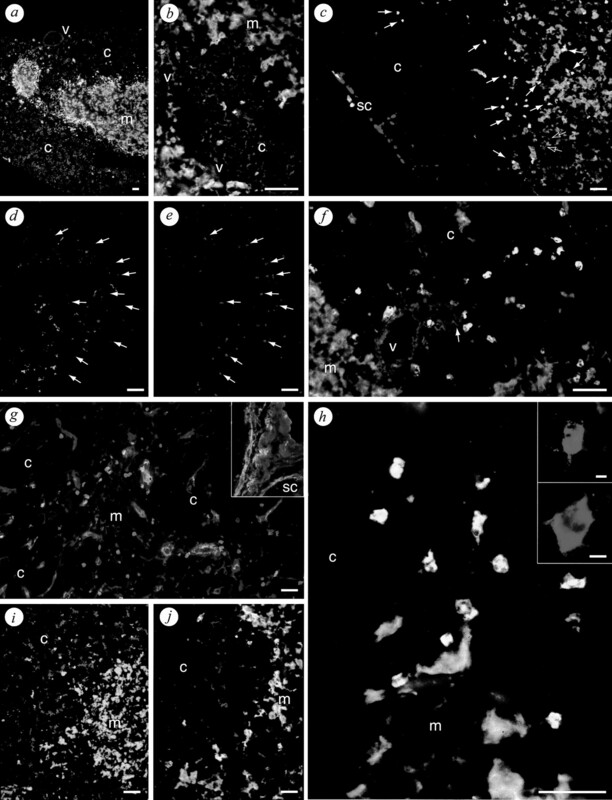 Tissue sections were fixed and preincubated with H2O2 and blocking buffer as described for immunofluorescent histochemistry. Primary Ab were applied either as supernatant or optimally diluted in blocking buffer and incubated at room temperature for 30 min. Slides were washed in TNT and incubated with peroxidase-conjugated anti-rat IgG or anti-hamster IgG (The Jackson Laboratory) for an additional 30 min. Labeling was visualized with diaminobenzene in the presence of nickel chloride. Cryostat sections of 4 μm were fixed in 4% paraformaldehyde for 10 min at room temperature, washed in PBS, and permeabilized in ethanol/acetic acid (2/1) for 5 min. Slides were washed in PBS and preincubated in reaction buffer (100 mM sodium cacodylate (pH 6), 1 mM CoCl2, 0.1 mM DTT, and 0.005% BSA) for 10 min at 37 C. Sections were blotted, and reaction buffer containing 20 U of TdT, 20 μM dNTP mix (Promega), and 2 μM digoxigenin-11-dUTP (Roche) was added for 60 min at 37°C. Slides were then passed into 2× SSC for 30 min at 37°C, washed in PBS, and incubated with alkaline phosphatase-conjugated anti-digoxigenin (F(ab′)2; Roche) for 30 min. After further washing, slides were placed into substrate buffer (100 mM Tris (pH 9.5), 150 mM NaCl, and 50 mM MgCl2) for 10 min. Sections were then incubated in substrate buffer containing 4.5 μg/ml 4-nitroblue tetrazolium chloride and 3.5 μg/ml 5-bromo-4-chloro-3-indolyl-phosphate and monitored for intensity of staining. Sections were washed in PBS containing 10 mM EDTA and mounted. The methodology and reagents were described in detail previously (23). 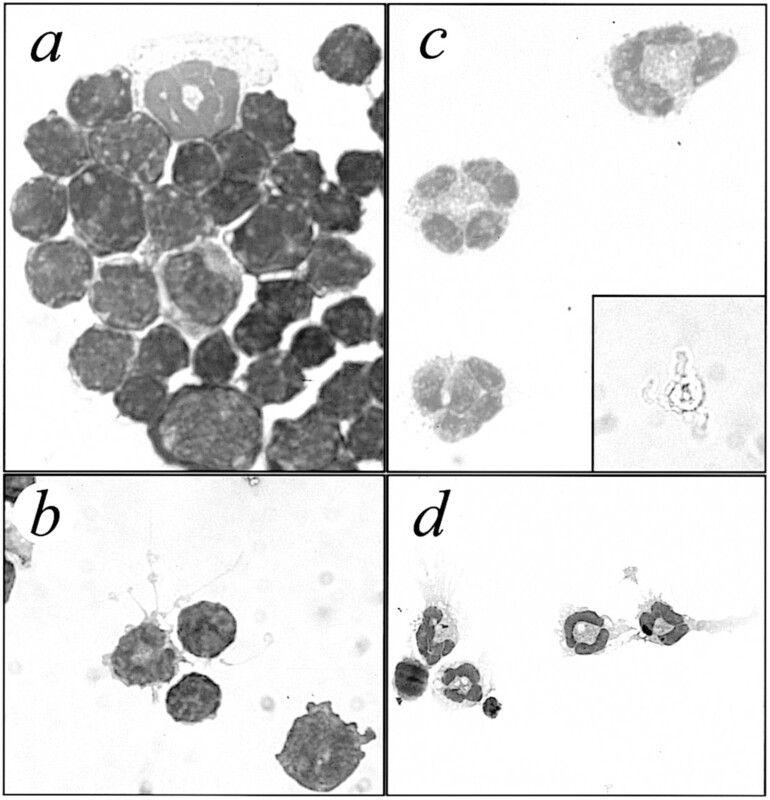 Briefly, eosinophils were enriched from monodispersed thymocytes as described above. The Abs NLDC-145 (anti-DEC-205) and YTS 169.4 (anti-CD8α) were added to the depletion mix, in addition to Mel 14, KT3, and RA3-6B2, to remove DC. Alternatively, eosinophils and DC were sorted to purity as described above. After purification steps, all cells were washed extensively in HBSS without calcium or magnesium, brought to room temperature, and supplemented with calcium. Basal and PMA-stimulated (27 nM) NADPH oxidase (O2 oxidoreductase) activities were measured over 60 min as the luminescence product of dimethylbiacridinium (lucigenin) reductive deoxygenation. Basal and PMA-stimulated (2.7 μM) peroxidase (H2O2 oxidoreductase) activities were measured as the luminescence product of luminol-deoxygenation. Triple-labeling immunohistochemical studies were conducted in 14-day-old C57BL/6 mice using a panel of myeloid markers, anti-CD11c (N418), and either the endothelial marker von Willebrand factor or fibronectin to stain the extracellular matrix. Fig. 1⇓, a and b, illustrates the demarcation between cortical epithelial cells and medullary CD11c+ DC. At this age, we observed a striking pattern of staining for anti-CD11b around the CMR and subcapsular sinus (SS). In triple-labeling experiments most CD11b+ cells colocalized with CD11c+ cells, predominately around the CMR but also in small numbers inside the medulla and cortex (Fig. 1⇓c, white arrows). However, CD11b+ cells rarely stained for CD11c in the inter- and intralobular septa and SS. A small number of cells inside the medulla were also single positive (Fig. 1⇓c, open arrows). The intensity of CD11c staining was much lower on CD11b double-positive cells (Fig. 1⇓, d and e) than on single-positive cells; note also the alignment of CD11b+ cells at the cortical face of the CMR. Higher power examination of the CMR (Fig. 1⇓f) showed CD11b+/CD11c+ cells scattered around, but distinct from, a von Willebrand factor-positive vessel. CD11b single-positive cells were also observed, but were directly adjacent to the venules in perivascular spaces. The distribution of CD11b+/CD11c+ cells strongly suggests they are part of the tissue parenchyma. Double labeling with anti-CD11b and anti-fibronectin shows that most CD11b-positive cells in the CMR and medulla are proximal to, but distinct from, fibronectin-positive extracellular matrix structures (Fig. 1⇓g); a similar pattern of staining was observed for laminin (not shown). In contrast, the SS (inset) and septa (not shown) contained CD11b-positive cells embedded in fibronectin-positive connective tissue. At high power (Fig. 1⇓h), CD11b+/CD11c+ cells in the CMR were heterogeneous in terms of morphology, but appeared multinucleated in many cases (inset). Staining with myeloid markers, including the rat anti-mouse macrophage markers ER-HR3 (Fig. 1⇓i), MOMA2 (Fig. 1⇓j), F4/80, HR-MP23, BM8, and MOMA1 (not shown), showed no comparable pattern of labeling to that of CD11b. To investigate further the phenotypic characteristics of the CD11b+/CD11c+ population, we isolated CD11c+ cells from the thymus. CD11b/CD11c double-positive cells are preferentially localized around CMR in the young murine thymus. Acetone-fixed cryostat sections were stained by immunofluorescence for N418 (CD11c; a–d, f, and h–j), M1/70 (CD11b; c and e–h), NLDC-145 (DEC-205; a), CDR1 (cortical epithelium; b), HR3 (macrophage; i), MOMA2 (macrophage/DC; j), anti-von Willebrand factor (endothelium; a–c, f, and h–j), anti-fibronectin (extracellular matrix; g). a, Seen at low power, staining with NLDC-145 (Alexas-546, red) strongly labels the cortical epithelium; staining of CD11c (FITC, green)-positive DC is not obvious (they are positive by FACS analysis). b, The reticular staining of the cortical epithelial marker CDR1 (Alexas-546, red) contrasts with the more confluent staining of CD11c in the CMR; note the presence of venules stained in blue. c, CD11b (Alexas-546, red) single-positive cells are found in the subcapsular sinus and septa, but rarely in the CMR (unfilled arrows). Discrete CD11b+/CD11c+ staining (yellow) is observed around the CMR and in the medulla (solid arrows), but rarely in the cortex. d and e, Staining for CD11c (d) and CD11b (e) in the same field. Staining for CD11c (arrows) on CD11b+ cells is faint compared with that on DC, but is still visible at lower Ab titration. f, Higher power view of the CMR. CD11b+/CD11c+ cells are distributed along the cortical face near a large von Willebrand factor-positive venule. Note the small number of CD11b single-positive cells directly adjacent to the venule. g, Seen without CD11c staining, CD11b-positive cells are concentrated at the CMR and sparsely distributed inside the medulla; staining is distinct from the fibronectin-positive extracellular matrix (AMCA, blue) in contrast to positive cells in the subcapsular sinus (inset), which are distributed along fibronectin-positive connective tissue. h, At high magnification CD11b+/CD11c+ cells are heterogeneous in terms of shape and size and are apparently multinucleated; inset, occasionally dendritic projections are stained. i, HR3 (Alexas-546, red) strongly labels macrophages in the cortex. j, MOMA2 (Alexas-546, red) labels macrophages in the cortex and medulla. Some CD11c+ cells are also stained. Scale bars = 100 μm. To obtain the CD11c+ thymic population, collagenase-digested tissue was fractionated by density gradient centrifugation (5), and the low buoyant density fraction (6–8% of total) was depleted of Mel 14+ (anti-CD62L), CD3+, and B220+ (anti-CD45R) cells by magnetic beads (∼60% CD11c+). They could be further enriched with positively selecting MACS beads or stained in three colors and electronically sorted for further analysis. All CD11c+ cells express high levels of CD44 (Fig. 2⇓) and heat-stable Ag (not shown), but could be split into two populations based on the level of class II expression (Fig. 2⇓b). The population characterized by intermediate expression of CD11c and low to negative class II, expressed CD11b and was CD8α−. In contrast, the class IIhigh population had higher expression of CD11c and was CD8α+ CD11b−, consistent with the previously reported phenotype of thymic DC (5). The low buoyant density depleted thymic cells were electronically sorted as described in Materials and Methods (Fig. 2⇓c); the sorted population was routinely >98% pure on reanalysis. Microscopic examination of sorted CD11b+ cells after May-Grünwald Giemsa staining revealed an annular or convoluted nucleus with a small irregular cytoplasm. The presence of eosinophilic granules in the cytoplasm identified the CD11b+ cells as eosinophils (Fig. 3⇓b). Cultured eosinophils were dependent on GM-CSF in culture. They put out a heterogeneous array of projections (that could sometimes be observed ex vivo; Fig. 3⇓c), ranging from thick to thin very long tendril-like strands, and were actively motile (Fig. 3⇓d). Magnetic bead isolation and FACS sorting of CD11b/CD11c double-positive eosinophils from collagenase-digested thymic tissues. Cells were prepared as described in Materials and Methods. 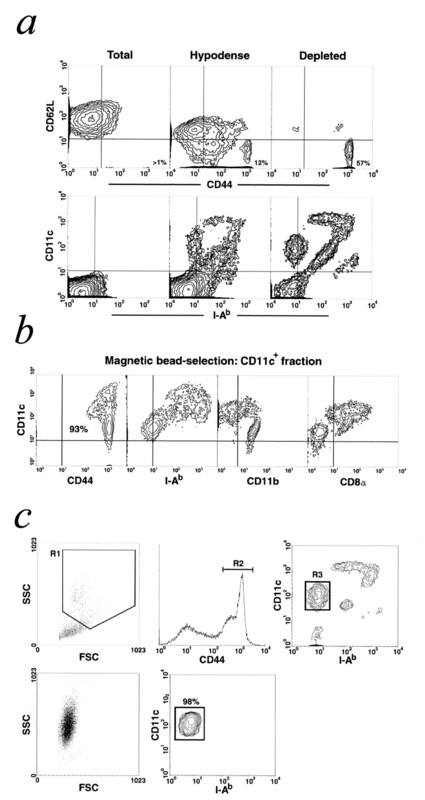 a, Note enrichment of CD44high, CD62L− cells (upper panel) and CD11cint, I-Alow/− cells (lower panel) after density gradient separation in the low buoyant density population (5% of total cells) and further enrichment after magnetic bead separation with Abs against CD62L, CD45R, and CD3. b, The depleted population was further purified by positive selection for CD11c (93% purity). Three populations are apparent: 1) CD11cint, I-Ablow/−, CD11bhigh, CD8α−; 2) CD11chigh, I-Abint, CD11b−, CD8α+; and 3) CD11cint/high, I-Abhigh, CD11b−, and CD8α+. c, Electronic cell sorting of CD11b+/CD11c+ cells from depleted, collagenase-digested thymic tissue (as described in Materials and Methods). Triple-labeled cells (upper panel) were gated for high SSC (R1), high expression of CD44 (R2) intermediate staining of CD11c, and low to negative staining of class II (R3) and were sorted with a FACSvantage cell sorter. Upon reanalysis (lower panel) >98% of cells fell within a gate 10% larger than the sort gate (R3); note the high SSC and low FSC of the sorted population. Conventional May-Grünwald-Giemsa staining of cytospins from progressively enriched populations of CD11c+ thymic cells. a, Total thymocytes from C57BL/6 mice; b, low buoyant density fraction from male H-Y TCR transgenic mice; c, FACS-sorted eosinophils; inset, phase contrast photograph of sorted eosinophil after 18 h culture in GM-CSF; d, sorted eosinophils after 7-day culture in the presence of GM-CSF. Original magnification, ×1250 (a and c) and ×675 (b and d). Phenotypic analysis was conducted on CD11c-selected populations gated for eosinophils or DC based on scatter characteristics and expression of class II and CD11c (Fig. 4⇓a). Eosinophils express myeloid-related markers, including F4/80 (24) and the more restricted macrophage marker BM8, but not CD13. Low surface expression of FcγRII, FcγRIII, CD25, and CD69 was observed consistent with previously reports of activated eosinophils (22, 25). In contrast, eosinophils did not express the thymic DC markers DEC-205 (Fig. 4⇓a), CD8α (Fig. 2⇑b) or BP-1 (5) (not shown); the granulocyte marker Ly-6G (Gr-1); or the myeloid differentiation/activation marker Ly-6C (not shown). Neutrophils and monocytes generally express the latter at high levels. a, Phenotypic characterization of purified thymic CD11c+ eosinophils and DC. N418+ cells selected by magnetic bead depletion were stained in three colors for FACS analysis. Each histogram represents 104–105 cells acquired on a FACSCalibur and gated for characteristic FSC and SSC and differences in class II expression: eosinophils; FSClow, SSChigh I-Alow and DC; FSChigh I-Aint/high. b, RT-PCR analysis of cytokine- and cell-specific protein expression from extracts of sorted thymic cell populations. Total RNA extracts from sorted populations (1 × 105 cells) of eosinophils (top panel) or eosinophils (Eo) and DC (lower panel) were reverse transcribed, cDNA diluted 1/5 (or 1/200 for β2m), and amplified with 35 cycles of PCR using primers specific for the coding sequences of the molecules shown. Extracts from bone marrow and mitogen-activated splenocytes were used as positive controls. A representative experiment of three is given. Eosinophils can act as APC and express costimulatory molecules under activating conditions (11, 14, 15). Thymic eosinophils express class II molecules (Fig. 2⇑b) and intermediate levels of class I molecules (Fig. 4⇑a). Low surface expression of the costimulatory molecules, CD86 (B7.2) and CD30L (CD153), a membrane-bound member of the TNF family, but not CD80 (B7.1), was detected (Fig. 4⇑a). Thus, thymic eosinophils are likely to be able to present Ag. Previous studies of eosinophil cytokine expression suggest that different combinations of cytokines may be linked to activation or disease states (26). We analyzed total RNA extracted from populations of eosinophils and DC, sorted to 98% purity (Fig. 2⇑c), for cytokine transcripts by RT-PCR (Fig. 4⇑b). A strong signal was present for the eosinophil-restricted granule component MBP in the CD11b+/CD11c+ double-positive population. Eosinophils expressed TGF-β and IL-16 mRNA consistent with their wide distribution among leukocytes. Detectable mRNA levels of the proinflammatory cytokines, IL-1α, IL-6, and TNF-α were present as previously reported in activated eosinophils (14, 15). Expression of eotaxin, IL-2, IL-3, IL-10, IL-12, IFN-γ, GM-CSF, and IL-5 was undetectable. GM-CSF and IL-5 has been reported to act as autocrine survival and recruitment factors for activated eosinophils in inflammatory foci (12). However, thymic eosinophils expressed mRNA for the closely related Th2 cytokines IL-4 and IL-13. Both are linked to eosinophil involvement in certain pathologies (27, 28) and are reported to aid recruitment, activation, and survival (29, 30). Transcriptional expression of CD11b was readily detectable in both eosinophils and DC (Fig. 4⇑b), although low surface expression is present on a minority of freshly isolated DC (Fig. 2⇑b) (5). DC, but not eosinophils, express the scavenger receptor DEC-205, consistent with FACS profiles, and eosinophils did not express relB, a nuclear protein of restricted expression that regulates NF-κB activity in DC and medullary epithelial cells (19). We investigated whether functional activation accompanied the presence of activation markers. Fig. 5⇓a shows a representative experiment in which >60% of depleted cells are eosinophils. The level of superoxide anion released from total thymocytes, using lucigenin-amplified chemiluminescence, was marginally above baseline. In the low buoyant density fraction, there was a log fold increase and 2 log fold increases in the depleted population. The time-dependent profile of luminescence emission is indicative of NADPH oxidase activation. The peak level of superoxide anion release in 98% pure FACS-sorted populations (Fig. 2⇑c) was not significantly different after PMA stimulation; however, peroxidase activity was significantly increased (Fig. 5⇓b). It has been reported that eosinophil extravasion can result in heightened superoxide anion release (31), consistent with our observation that CD11b+/CD11c+ eosinophils are inside the tissue parenchyma, and their NAPDH oxidase activity is maximal under nonstimulated conditions. Basal and stimulated extracellular production of superoxide anion in cell populations progressively enriched for eosinophils. 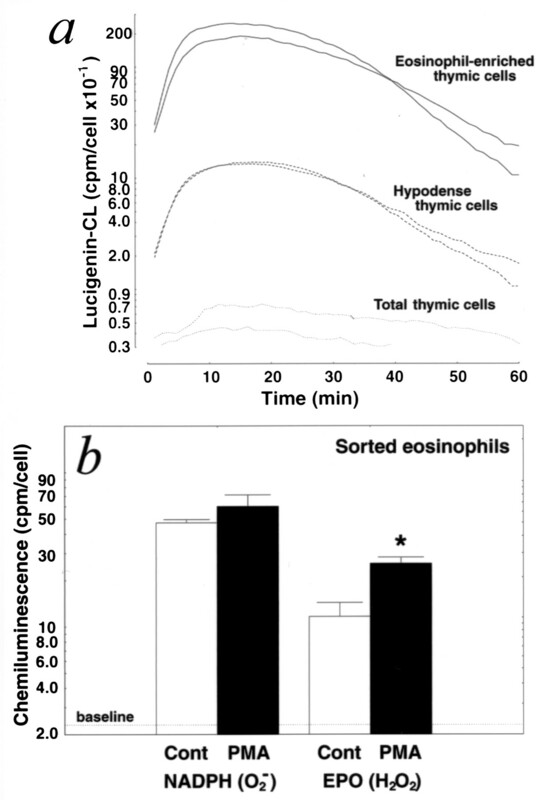 a, Lucigenin-amplified chemiluminescence (CL) production was measured each min over 1 h in a suspension of freshly isolated total thymocytes taken from collagenase-digested tissue (dotted lines), hypodense thymic cells after density gradient centrifugation (dashed lines), and eosinophil-enriched populations after magnetic bead depletion, including NLDC-145, CD4, and CD8 to remove DC (solid lines). b, Histograms representing the peak mean counts of lucigenin-amplified CL representing NAPDH activity and luminol-amplified CL measuring peroxidase activity from basal (□) and PMA-stimulated (▪) eosinophils. During the neonatal period, the thymus undergoes expansion as cells are generated to furnish the adult peripheral T cell pool; new production is diminished with age, as reflected in shrinking of the cortex (4). Eosinophil numbers increase sharply during the neonatal period to reach a maximum at 2 wk of age (Fig. 6⇓a). At this time point they are roughly equal in absolute number to DC isolated in tandem. While the number of DC continues to increase with tissue size, the absolute number of eosinophils decreases, reflected by a sharp drop in eosinophil numbers at 28 days of age (Fig. 6⇓b). Absolute numbers of eosinophils begin to rise again at 16 wk, corresponding to the commencement of thymic involution. The localization of eosinophils also changes during ontogeny. In neonatal animals, CD11b+/CD11c+ cells are concentrated at the CMR (Fig. 1⇑); at latter time points they become more prominent in the medulla (not shown). No differences were noted in cell number or phenotype between sexes or among C57BL/6, BALB/c, DBA/2, and CBA strains of mice. In RelB−/− mice, who lack thymic medullary epithelial cells and thus fail to form a medulla (19), few CD11b+ cells were detected in the thymic parenchyma compared with age-matched RelB+/− littermates (1.2 ± 0.2 vs 51.7 ± 2.7 cells/mm2, mean ± SEM; n = 3; p < 0.001, by independent t test), although they were observed in the SS (not shown). Number of CD11b+ eosinophils and CD8α+ DC present during thymic ontogeny. Low buoyant density thymic cells representing >8% of the total number of thymocytes were isolated as described in Materials and Methods and stained in three colors with the Abs anti-I-Ab-FITC or anti-I-E-FITC, anti-CD11c-PE, and anti-CD11b-biotin or anti-CD8α-biotin; streptavidin-APC was used as a second layer. CD11b+ cells inside gates R1 and R3 (shown in Fig. 3⇑) were considered eosinophils, CD8α+ cells gated for high FSC, high expression of CD11c, and class II (see Fig. 2⇑) were counted as DC. a, Mean number of eosinophils (•) and DC (○) isolated per thymus. b, Eosinophils (•) and DC (○) expressed as the percentage of total thymocytes. Duplicate staining was conducted and quantified from in three to eight animals; error bars represent the SEM. Given the localization of eosinophils around the CMR, in contact with immature double-positive thymocytes susceptible to negative selection, and their augmented recruitment during the neonatal period, we examined their behavior in a model of acute negative selection. Injection of the cognate peptide into TCR transgenic mice induces prompt apoptosis in thymocytes (20, 32, 33, 34). While at later time points thymic atrophy can be linked to peripheral activation (32, 33), initially cell death is due to peptide presentation within the thymus (33, 34). Recently it was observed that peptide injection into a class I-restricted TCR transgenic model resulted in an infiltration of CD11b+ granulocytes into the thymus within 1 h. This was before apoptosis became apparent, and no other organs were affected (20). We repeated the experiments on class I- and class II-restricting backgrounds. The proportion of total thymocytes stained for annexin V in class I-restricted female H-Y TCR transgenics increased 6 h after cognate peptide injection, particularly among the CD4low, CD8low double-positive population associated with apoptosis (Fig. 7⇓a) (35). This was reflected in a significantly higher number of TUNEL-positive apoptotic bodies in cryostat sections from peptide-treated mice (Table I⇓). We observed a progressive increase in the number of CD11b+ cells in the thymus after peptide injection. Isolated cells had the same phenotype as thymic eosinophils from normal mice, and cytospins of enriched populations confirmed them to be the only granulocyte population. Six hours after injection the absolute number of CD11b+/CD11c+ cells had increased 75% (Fig. 7⇓b). In terms of absolute numbers, eosinophils are roughly equivalent in both negatively selecting males, which delete all TCR+ thymocytes, and positively selecting female mice. However, the relative percentage of eosinophils to total cellularity in males was 2-fold higher (Fig. 7⇓b). FACS analyses of thymic cell populations and quantification of eosinophil numbers after i.p. administration of 50 nmol of cognate peptide into TCR transgenic mice. a, Upper panel, Total thymocytes stained in three colors: annexin V-FITC, CD4-PerPC, and CD8-APC. Cells (104) were acquired on a FACSCalibur. Contour plots show that 6 h after peptide injection in H-Y TCR transgenic mice, there is a clear increase in the CD4low/CD8low population (gated), of which 60% are positive for surface annexin V (histogram inset); these cells account for about 7% of the total thymocytes × 3.5 control animals (6 h of PBS). 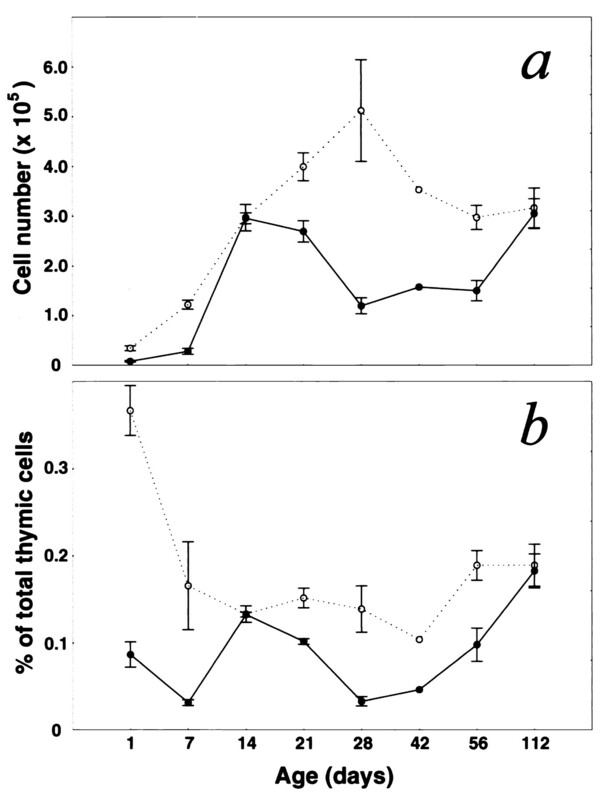 b and c, Low buoyant density thymic cells representing >8% of the total number of thymocytes were isolated as described in Materials and Methods and stained in three colors with anti-I-Ab-FITC or I-E-FITC, anti-CD11c-PE, and anti-CD11b-biotin; streptavidin-APC was used as a second layer. CD11b+ cells inside gates R1 and R3 (shown in Fig. 3⇑) were considered eosinophils. Histograms show the number of eosinophils isolated per thymus on the left ordinate and the percentage of total thymocytes on the right ordinate for class I-restricted H-Y TCR transgenic mice (21 days old) and age-matched controls (b) and class II-restricted HA TCR transgenic mice, β2m−/−, I-Aβ−/− (28 days old) and the age-matched control strain (c). Data were collected from at least two separate experiments, and each point represents the mean of three or more animals; error bars represent the SEM. ∗, p < 0.01 compared with vehicle-treated mice (n = 3), result of independent t test. In serial thymic sections from female H-Y TCR transgenics stained for CD11b and DNA fragmentation, a measure of apoptosis, there was a scattering of apoptotic bodies in and around medullary regions (Fig. 8⇓a). Staining for CD11b was also concentrated in and around the medulla (Fig. 8⇓d). Three hours after injection, vessels containing clusters of CD11b+ cells appeared (not shown). By 6 h apoptotic bodies were distributed throughout the tissue, with the exception of cortical regions directly underneath the capsule, the site of immature TCR− thymocytes (Fig. 8⇓b). The distribution of CD11b-positive cells closely followed that of the TUNEL staining (Fig. 8⇓e). In male mice, in which negative selection is constitutive, the level of apoptosis is not as significant as that after peptide administration (Fig. 8⇓c), but CD11b+ eosinophils are distributed throughout the tissue (Fig. 8⇓f). Given the age-related differences in eosinophil recruitment we conducted experiments at 14, 21, and 35 days of age. Peptide administration induced similar increases in eosinophil numbers at all ages (not shown). Thus, eosinophil recruitment is constitutively higher in female H-Y TCR mice and can be further increased by peptide presentation. Although cellularity is considerably diminished in male mice, in which cognate Ag is constitutively available, eosinophil numbers are at levels similar to those in females. 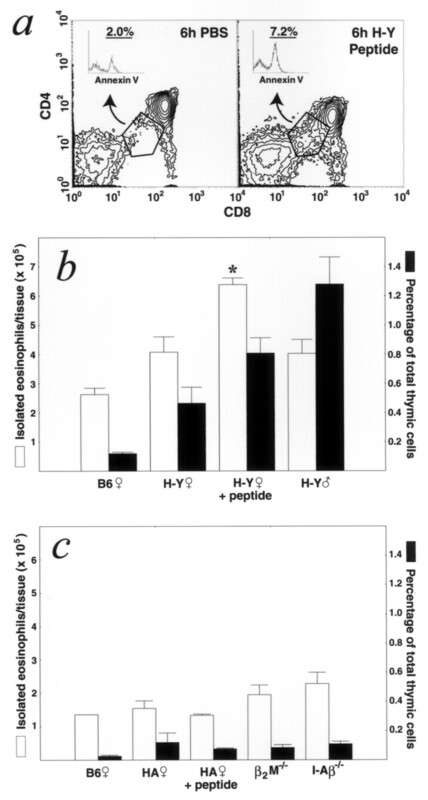 Distribution of CD11b+ cells in the thymus after cognate peptide injection in female H-Y TCR transgenic mice and in untreated male mice. Immunohistochemical staining was conducted on serial sections for TUNEL labeling of fragmented DNA, a marker of apoptosis (a–c), and anti-CD11b (M1/70; d–f). In tissue from PBS-injected H-Y TCR female mice (a and d) scattered apoptosis was also observed, particularly around medullary regions where CD11b+ cells are concentrated. b and e, Six hours after peptide injection apoptotic bodies were present throughout the tissue; staining for CD11b+ was distributed throughout fields of apoptotic bodies. c and f, In male mice apoptotic bodies were scattered throughout the tissue, although not at the same density as in the acute negative selection model, CD11b staining was observed concentrated in vessels and spread throughout the tissue. c, cortex; sc, subcapsular sinus; m, medull. Scale bars = 100 μm. In contrast, injection of the cognate peptide into class II-restricted HA TCR mice had no effect on the recruitment of eosinophils despite an increased number of apoptotic bodies, as assessed by TUNEL staining (Table I⇑). The absolute number of CD11b+ cells was not different from that in age-matched control strains either before or after injection at 28 days (Fig. 7⇑c), although the number of CD11b+ cells measured on tissue sections was significantly lower than that in control strains at 14 days (Table I⇑). MHC II-null mutant mice and class I-null mice contained similar numbers of eosinophils as age-matched controls (Fig. 7⇑c). Therefore, the signals drawing thymic eosinophils may be a result of class I-restricted selection and/or may be related to the high number of mature CD8 single-positive cells in the thymus of H-Y TCR mice. Eosinophils were identified in this study by the dual expression of CD11b and CD11c. In young mice, CD11b+/CD11c+ cells were anatomically restricted and had a granular appearance under high power observation. The eosinophil specific traits, expression of MBP, and eosinophilic cytoplasmic granules after Giemsa staining characterized the sorted population. Thymic eosinophils display some features of activated eosinophils. There is a loss of Gr-1 and CD62L expression, which are present on bone marrow eosinophils. They express several phenotypic markers associated with activation, including CD25, CD69, and low levels of class II. The cells are hypodense, a characteristic of some circulating eosinophils in hypereosinophilic patients and in allergic inflammatory foci (10, 36), and their level of superoxide production was maximal without further stimulation. Although little information is available on the phenotypic and functional characteristics of tissue-marginated eosinophils, it is proposed that partial activation or priming may be a normal facet of eosinophil entry into tissue (10). Movement across endothelial barriers is enough to activate circulating human eosinophils, as measured by increased expression of CD11b and superoxide anion production (31), both features of thymic eosinophils. RT-PCR of sorted eosinophil RNA extracts revealed a distinct pattern of cytokine mRNA. Differential patterns of eosinophil cytokine production have been reported in different disease states. For example, IL-5 is expressed by intestinal tract eosinophils in celiac, but not Crohn’s, disease (13). Eosinophils taken from bronchial lavage or nasal polyps of atopic individuals express IL-5 and GM-CSF, which are proposed to act in an autocrine fashion, respectively, to enhance recruitment to (37) and survival (12) at sites of inflammation. Eosinophils are capable of producing multiple subsets of cytokines in a directed fashion. Binding of IgA complexes in vitro induces IL-10 secretion in eosinophils taken from hypereosinophilic patients, while the ligation of CD28 induces IL-2 and IFN-γ secretion (11). Thymic eosinophils expressed mRNA for IL-4 and IL-13, which are closely related cytokines that share receptors and have overlapping functions. Critical in generating eosinophil responses to parasitic infection (27), IL-4 and IL-13 have recently been associated with activation and survival of human peripheral blood eosinophils (29) and recruitment of murine eosinophils during allergen-induced airway inflammation (30), both in synergy with TNF-α. Expression of IL-4, IL-13, and TNF-α, therefore, represents a cytokine pattern associated with extravasion and activation. It seems likely that eosinophils are recruited into the thymus as in normal subepithelial mucosa. Eotaxin, an eosinophil-specific CCR3 ligand, is constitutively expressed in thymus and lymph nodes (38). Eotaxin null mice have a reduction in both the number of circulating (39) and tissue-marginated eosinophils, including thymic eosinophils (40), suggesting that the baseline level of eosinophils in the thymus is maintained through an eotaxin-driven pathway of extravasion. Comparison of CD11c+ cells isolated at different time points suggests that eosinophil recruitment is particularly augmented between 7–14 days and in older mice (>100 days old). Recruitment seems to diminish between these periods, since the absolute number of thymic eosinophils drops 50% between 14 and 28 days of age. In comparison, DC numbers are closely related to total thymic cellularity, consistent with experiments showing that both T cells and DC arise from the same progenitor in the thymus (41). These data imply that eosinophils have a relatively short half-life in the thymus; it has been calculated that marginated tissue eosinophils survive for at least 3 wk after extravasion (10). On tissue sections there is also a distinct difference in anatomical distribution; 2-wk-old animals have CD11b+ cells concentrated in the CMR, while at 16 wk eosinophils are distributed evenly throughout the medulla and into the CMR. Without knowing the source of the chemotactic signal or its stimulus, it is difficult to determine the significance of the differential spatial and temporal distribution of thymic eosinophils. Several lines of evidence suggest that under physiological conditions, negative selection of developing double-positive thymocytes occurs in the CMR (2, 4). In addition, between 7 and 14 days of age there is an exponential increase in the cellularity of the thymus caused primarily by the clonal expansion of double-positive thymocytes (1). Accordingly, recruitment of eosinophils is associated with increased demand for repertoire selection and is localized to the region in which it is occurring. Thus, an important observation in this study was the dramatic elevation of eosinophil numbers in a model of acute negative selection. This finding confirms and extends a previous report from a different MHC class I-restricted TCR transgenic line in which cognate peptide injection induced a prompt influx of CD11b+ granulocytes (20). In both studies, CD11b+ cells were distributed throughout the apoptotic fields. The granulocyte recruitment is unlikely to be an artifact of systemic activation, since infiltration was already significant at 3 h, was only apparent in the thymus, and was selective for eosinophils. In addition, eosinophils were distributed throughout the tissue of the negatively selecting male H-Y TCR transgenic mouse in which the cognate Ag is constitutively present. When these experiments were repeated in class II-restricted HA TCR mice, systemic administration of cognate peptide failed to recruit eosinophils, although significant apoptosis was observed. Taken together, eosinophil recruitment above baseline is associated with high affinity, class I-restricted selection/deletion and is not likely to be a nonspecific reaction to cell death. However, significant differences exist between TCR transgenic models, in particular the affinity of the TCR for the peptide/MHC complex, that may affect the mechanism of thymic deletion (42). Although striking differences in eosinophil numbers are observed between H-Y and HA TCR transgenic models we cannot exclude the possibility that these might be intrinsic to the model and not a result of the restriction element. Further analysis of TCR transgenic mice that encompasses a wide spectrum of avidity will determine whether eosinophil recruitment is indeed associated with MHC class I-restricted selection or with a particular mechanism of thymocyte deletion. Interestingly, the number of thymic eosinophils in female Rag-1−/− H-Y mice was greater than that age-matched controls. These mice have an increased thymic medullary area and an exaggerated proportion of mature CD8+ cells compared with normal mice. Therefore, signals released from mature thymocytes or other medullary components could elevate eosinophil numbers under steady state conditions. Consistent with this hypothesis, eosinophils were not present in RelB−/− mice, which do not form a thymic medulla but are characterized by granulopoiesis (19). Mature CD8 single-positive cells only begin to populate the medulla after 7 days (43), consistent with the time point at which a large influx of eosinophils is observed. Recent evidence has cast the traditional nonredundant physiological role of eosinophils, protection against helminthic infection, into doubt (10). Moreover, eosinophils express a diverse array of cytokines and cell surface ligands (11, 13), which suggest that it may have an immunomodulatory role. Eosinophils are associated with most inflammatory and infectious disorders and have been implicated beneficially in anti-tumor cytotoxicity and wound healing. Yet, most of our knowledge about this cell comes from analysis in particular pathologies, e.g., hypereosinophilia, or in hypersensitivity reactions (10). These situations may not accurately reflect the physiological role of eosinophils, especially tissue-marginated eosinophils, under nonpathological conditions. In this study we show that murine thymic eosinophils express Ag-presenting molecules and have several physical characteristics of APCs that enhance cellular contact, including nonadherence, motility, and dendritic projections. Others have shown that both human and murine eosinophils are capable of acting as APCs. They express costimulatory molecules previously shown to be involved in clonal deletion, such as CD30 ligand (CD153) and CD86 (44, 45). Uniquely, eosinophils produce considerable levels of free radicals that diffuse freely through membranes in the immediate vicinity of their release. Developing thymocytes may have an increased sensitivity to these molecules (e.g., through down-regulation of Cu/Zn superoxide dismutase) that could induce apoptosis in concert with other signals given simultaneously or sequentially. Eosinophils have been identified in the thymus, based on their distinctive granular staining (40, 46, 47) or peroxidase activity (48). In this study we describe a method by which tissue-bound eosinophils can be isolated from normal tissue. We demonstrate that the eosinophil is a regulated component of the murine thymus that is recruited in the absence of overt inflammatory stimulus similar to other tissue-marginated eosinophils. In mucosal tissue, eosinophils assume a sentinel position in the subepithelium among macrophages, DC, and lymphocytes (40). Their precise role under these circumstances is not clear; however, as with thymic eosinophils, it is likely to be different from that of eosinophils recruited during allergic inflammation. Further insight into this cell population may be useful in clarifying not only the role of eosinophils in thymic function, but also the physiological role of tissue-marginated eosinophils in general, leading to a better understanding of their participation in a variety of physiological and pathological responses, in particular atopic diseases. We acknowledge A. Esling for technical assistance, I. Cisse for animal husbandry, C. Garcia (Institut National de la Santé et de la Recherche Médicale, Unité 373) for assistance with cell sorting, and A. T. Nguyen (Institut National de la Santé et de la Recherche Médicale, Unité 507) for chemiluminescence measurement. P. J. Leenen, F. Lepault, and C. Boitard are thanked for the kind gift of antiserum; M. Dy for cytokine PCR primers; B. Rocha, B. Lucas, and A. Sarukhan for the use of their TCR transgenic lines; and P. Throsby for advice with figures. We are gratefully to B. Rocha, F. Geissmann, R. Monteiro, B. Descamps-Latscha, A. Sarukhan, and M. Dy for advice on the manuscript. ↵2 Abbreviations used in this paper: DC, dendritic cell; CMR, cortico-medullary region; β2m, β2-microglobulin; B6, C57BL/6; HA, hemagglutinin; Rag, recombinase-activating gene; TNT, Tris/saline/Tween 20; AMCA, 7-amino-4-methylcoumarin-3-acetic acid; MSS, monovalent salt solution; SA, streptavidin; FSC, forward scatter; SSC, side scatter; MBP, major basic protein; SS, subcapsular sinus; INSERM, Institut National de la Santé et de la Recherche Médicale.